Most of us have had (or at least know of people who have had) a dog who was positively terrified of thunderstorms and/or fireworks. And those of us who have experienced summer months with a storm-scared dog know that this is not one of the fun aspects of pet ownership. It is heartbreaking to see a dog so utterly scared, panting, shaking, drooling, hiding, and to feel so helpless in the moment to ease their fears. But! 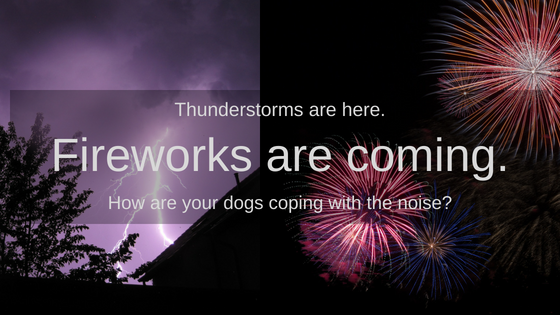 There ARE things we can do to try to help our furry friends ride out the storm (or booming fireworks). 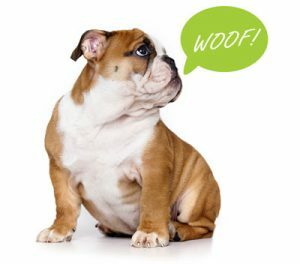 Any breed of dog can experience noise or storm phobias, and some dogs can be unaffected for years, then gradually start to develop a fear that can worsen with time (most dogs actually become increasingly scared as they get older). Some dogs even feed off our emotional status. If they perceive that we are stressed or frightened during a storm (even if we are just stressing about keeping them calm), this can cause them to become anxious, as well. What starts as an emotional trigger (being scared), turns into a fight or flight response in the body, causing alterations in the physiology, changing behavior and hormonal signals in the body. Each dog responds slightly differently to storms and fireworks, and to the various therapies for storm and noise phobia. First, create a safe space for your dog. An area where they feel comforted and can ‘escape’ to when scared or stressed. This may be a quiet room in a basement, or a crate/kennel partially covered with a blanket. It is not usually a good idea to try to confine the dog to an area, as this can make them feel trapped and cause further anxiety. They should be able to come and go to their safe space as they choose. White noise or loud music can help drown out the noise from the fireworks/thunder. Drawing the curtains closed may also help decrease the visual stimuli. Behavioral training (counterconditioning) can also be useful; this is an effort to try to desensitize your pet to the stimulus and create a more favorable emotional response to it. You can try to get your dog to engage in an activity that he/she normally enjoys, such as playing fetch, or tug-o-war, or playing with a favorite toy, to redirect the attention to a more pleasant activity. This can be difficult to achieve when a dog is scared, so anxiety medication may be necessary while working on this training. You can also work on activities that result in “rewardable behavior”. This involves getting your pets to do behaviors that you can reward with a treat, such as sitting, laying down, shaking, rolling over, etc. It is important to not to reward and reinforce the fear behavior (panting, shaking), so make sure they are performing the requested behavior before giving the reward. Some dogs can also be distracted with a long-lasting treat, such as a toy with peanut butter smeared in it, homemade pupcicles, chew bones, etc. Again, ask your dog to do a specific behavior before giving them the treat so they are not being rewarded for exhibiting signs of fear. Some of this training may be done in the ‘off season’ by using a CD with thunderstorm noises (or just asking Alexa to play some thunderstorm sounds), this way you can better control the situation. Some dogs may also respond positively to snug clothing (such as a ThunderShirt) or pheromones. No placebo-controlled studies have been done to prove the efficacy of these methods, and not every dog may respond, but some dogs do seem to be comforted and become more relaxed. Pheromones are chemical signals that animals release to communicate with one another. There are synthetic pheromones that you can purchase that is the same as the pheromone that a nursing dog releases to reassure her puppies. This may help some dogs feel more relaxed and secure in stressful situations. In many cases, we need to rely on medications to help your furry friends cope with the storm and noise phobia. We may need to use an anxiolytic (anti-anxiety) medication or even an anti-depressant to help your dog weather the storm. There is even a newer medication on the market that is specifically designed for dogs with noise phobia. Talk with your vet to determine what medication would work best for your dog. When fear and anxiety alter the body’s physiology, it can change how medications are metabolized and work, so it is important with all these medications that they be given before a storm hits or the fireworks go off. The most common side effect we see with these medications is lethargy or mild sedation, but other specific side effects depends on the medication used. These medications often work best with some form of behavior modification training to try to help reduce the fear response in the long run. We know how hard it can be to cope with a dog who is in a complete panicked state during firework and thunderstorm season. Please talk with us on how we can help you help your furry friend.